As I spend so much time cycling, food is never far from my mind and I have a very hearty appetite. And yes, one of the joys of cycling is you can mainline as much cake as you damn well please, but it does get to the point where you realise something other than junk might be a good idea. As often as I can, I’ll go for ‘real’ food over bars, shakes and the like, but often that’s not possible as I’m really busy and/or away from home. I recently started experimenting with some new ways of satisfying my ravenous hunger (and thirst) whilst getting a few nutrients at the same time. I find it helps if I have an alternative to cake readily at hand so I can just grab something and chow down. If the only thing available is biscuits, I’ll eat the pack, but if there’s something better for me, I’ll go for that. I started off by testing the Protein Pancake Mix. Protein pancakes seem to be a ‘thing’ right now with various recipes floating about on the interweb that generally use protein powder to replace flour, thus giving you fewer carbs, more muscle building protein and the option of not eating gluten, which everyone has decided they hate (for the time being). I tried one of these recipes last year and the results were absolutely disgusting, ranking in the top tier of horrid things I’ve fed to my husband, so I was interested to try this ready-made mix. 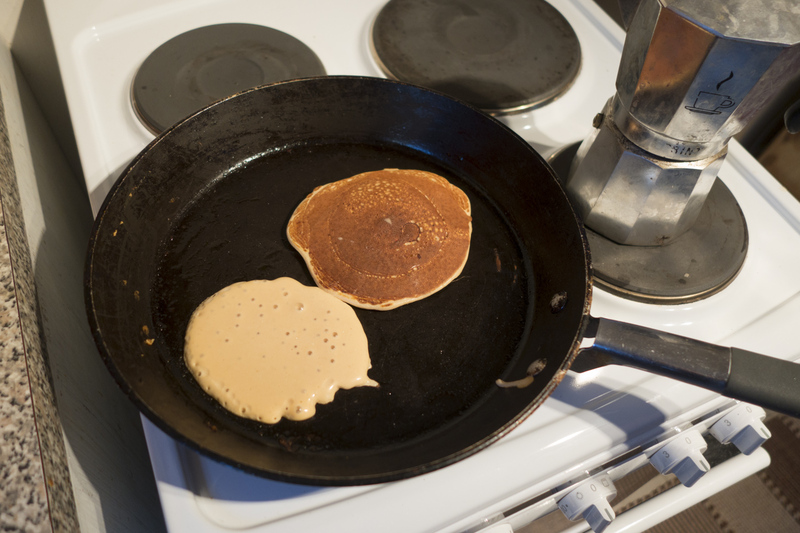 It’s really easy to prepare – you just add milk or water, mix it all up and then cook it like you would normal pancakes. I opted to use organic whole milk. The first bite was pretty good, as they taste like golden syrup, but then I quickly became put off by the squeaky, chewy texture and my husband felt the same. Maybe protein pancakes are an acquired taste? I think I’ll stick with eggs and toast in future. Next on the list was the Tri Carb powdered drink which I got on better with. This tropical flavoured sports drink contains the carbohydrates Maltodextrin, Fructose and Palitinose® which can help you avoid an energy crash when you’re out riding over longer periods or at higher intensity. Why? Because the body only has enough glycogen to fuel you for 90 minutes, after which you need to supply it with an alternative energy source: carbs. 500mg of electrolytes top up lost minerals/salts. The powder dissolves quickly and easily, creating a drink that reminds me of ice pops; quite sweet but really nice. Out on the ride, I found it easy to drink and the fairly intense flavour made me feel like it must be doing something. Silly, huh? It’s hard to really, truly tell whether using it has been keeping my energy levels higher than plain water as there are so many variables every time I ride, but anything that makes you feel faster or stronger is a good thing, psychological or not. Anyway, I’m no nutritionist so I just have to go on how I feel. 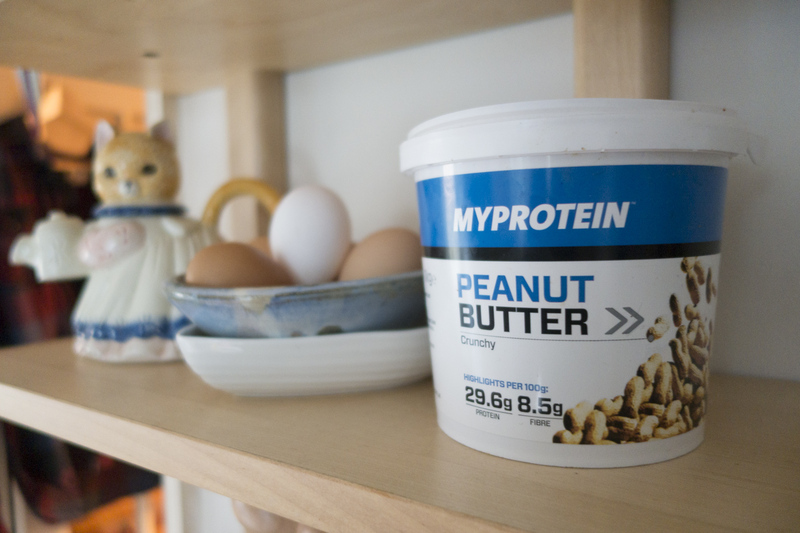 Post ride, I explored several of MyProtein’s options – another drink ‘Re:Charge,’ the Oats and Whey protein bars and MyProtein’s peanut butter. Post exercise there’s a 20 minute window where your muscles are primed to receive nutrients, and eating a protein packed snack during this time can mean that you recover more quickly and have achey legs for a shorter amount of time; great if you want to get out riding again as quickly as possible. I tend to try and go for some ‘real’ food if I can, but sometimes that isn’t possible so a recovery bar or shake can be a good stop-gap until you can grab something more substantial. Re:Charge is a recovery drink containing balanced levels of protein, carbs, electrolytes and creatine to help restore muscle glycogen lost through exercise and aid recovery. It differs in a couple of ways from all the other recovery drinks I’ve tried, firstly in that it tastes like fruit squash rather than milkshake, and secondly in that it’s a bit cheaper – the 1.5kg pack makes 30 servings so it winds up around 75p per drink. The taste is fairly strong, maybe a bit too strong for me, but it sits well on the stomach. It’s easy to mix up so a good bet if you want to just down something when you’re done riding. The Oats and Whey bars could be an alternative to the recovery drink or you can just eat them as a snack if you’re looking for something better than a chocolate bar or another slice of cake. At 22g per 88g bar, they’re absolutely packed with protein, which I find helpful as I’m a lazy vegetarian and therefore base most of my meals and snacks around carbs. The carbs come from a blend of oats, which are slow release and you get your protein from the whey. 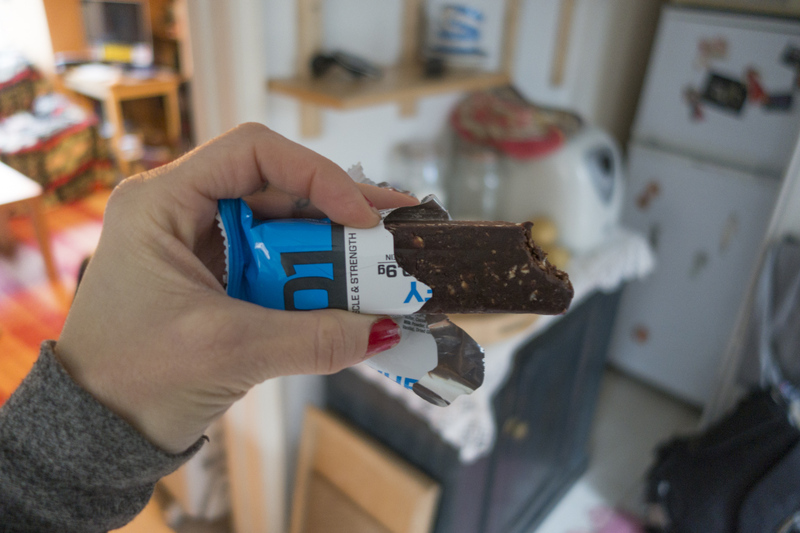 The chocolate chip Oats and Whey bars that I’ve been trying are hefty muthas – far bigger and more dense that the regular energy bars I’m accustomed to eating. As they’re called Oats and Whey bars, I was kind of expecting something more like flapjack, but these aren’t – the texture and flavour is not so far from a Double Decker bar. My husband loves Double Deckers so he’s been powering his way through one after every mountain bike ride, whereas I found it a little harder to work my way through a whole ONE, preferring to split them in half. I guess they must be pretty satisfying as I am usually quite greedy!